For today’s card I used the Creepy Cute stamp set by Simon Says Stamp. 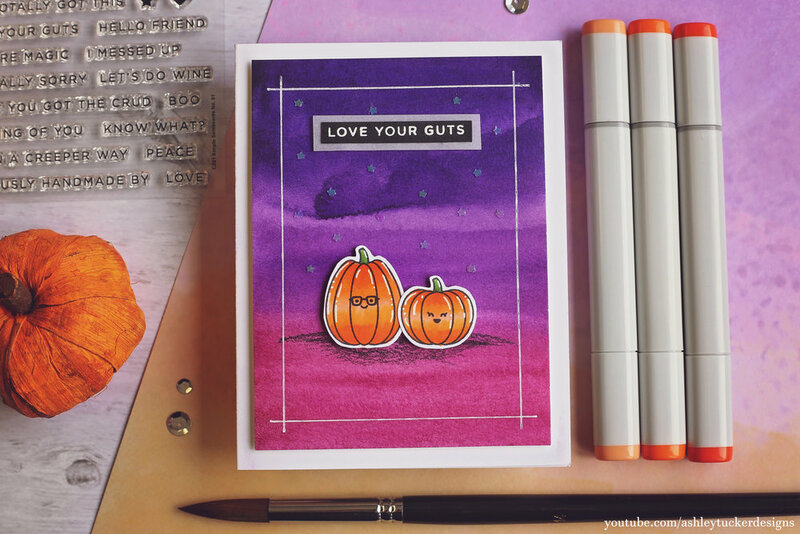 I created a Halloween sky using my Distress Oxide sky technique. I started with a piece of Canson watercolor paper taped down to a board. I then blended Distress Oxide ink on the paper ink the colors Candied Apple, Spiced Marmalade, Black Soot, and Seedless Preserves. I then used a paintbrush to paint cloud shapes all over the panel using clean water. I used a paper towel to blot up the water which pulls up the ink leaving behind my wispy looking clouds. I went over the clouds using my Wink of Stella glitter brush to make them really sparkly. The last thing I did to create this background is take a white gel pen and outline the underside of each cloud. Check out the video to see this technique in detail! I stamped the haunted house image from the Creepy Cute stamp set onto a piece of dark gray card stock with Versamark ink. I heat embossed the image with a white embossing powder. I fussy cut the house out using some scissors and then used my N2 Copic marker to add a little bit of shading to the image. I took a scrap piece of black card stock and cut a curve out of it to create a hill for my house to sit on. Next I took and A2 sixe card base and glued a piece of black card stock to it. I then took my sky background and adhered it to a piece of vellum to give it a border. I popped up that panel onto the card base with foam tape. I glued the hill piece I created to the bottom of the sky panel with my Gina K Connect glue. I also glued down the house. 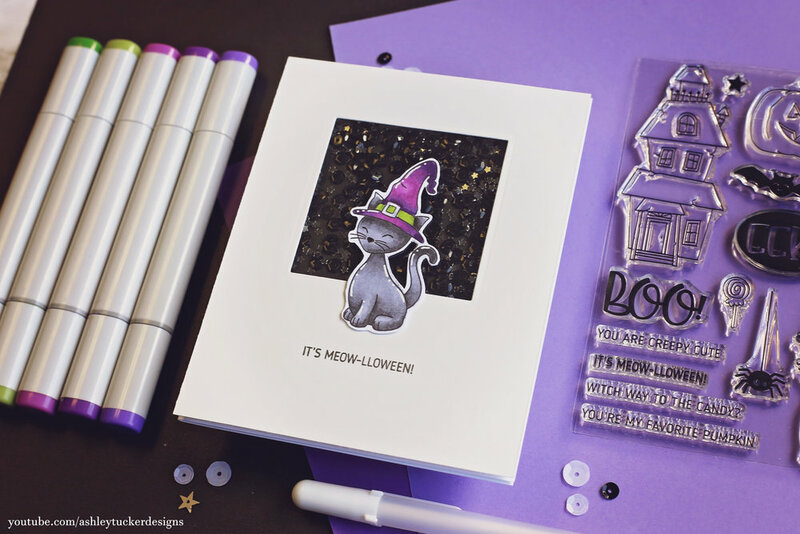 For the sentiment I used a stamp which says “Witch way is the candy?” and heat embossed it in white on black card stock. I cut it down to a strip and glued it to vellum so that it would have a border. I popped that sentiment up on the card next to my creepy house. I used my Prismacolor pencils to add a little more detail to my house. I went over the windows using the white pencil and then the PC918 to make them look like they are glowing. I then took the black Prismacolor pencil and deepened up the shading and added a drop shadow. I went over the sentiment with the Wink of Stella glitter brush and added a mixture of sequins across the card. I spread them from the bottom left to the top right and glued them with my Gina K Connect glue. Finally I went around the border of the sky panel with a white gel pen doing some dashed lines.